Process Inlet—Air to be dried. May be outside air, inside air or, more commonly, a mixture of air with high humidity content.Process Outlet—Air is dried by desiccant wheel. May be cooled, filtered or otherwise handled. Relative humidity is substantially lower and temperature slightly raised. Reactivation Inlet—Air flow, usually outside air, that drives moisture off wheel. Reactivation air is heated by direct-fired gas burner or indirect-fired water or steam coils. 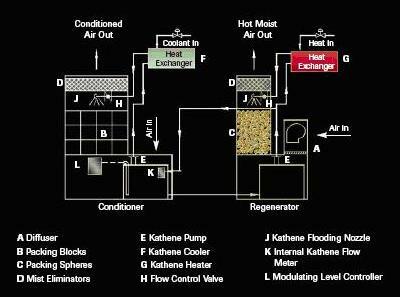 Reactivation Outlet—Hot, wet air from wheel is exhausted outside or passed through an air-to-air heat exchanger. Using a heat exchanger to preheat incoming process air offers substantial savings in northern climates.